Digital is not a new concept - recent years have seen the rapid evolution of technology from the Internet of Things to chatbots and machine learning. Our culture has ensured that we’ve shifted towards this world in which everything from train and plane tickets, to banking, to recipes are digital. As a result, customer expectations have changed and we expect responsive, quick and seamless processes and interactions with businesses. Without digitally transforming your business, you cannot deliver the exceptional customer service that is expected, however it is still very challenging for organisations to make the required changes. 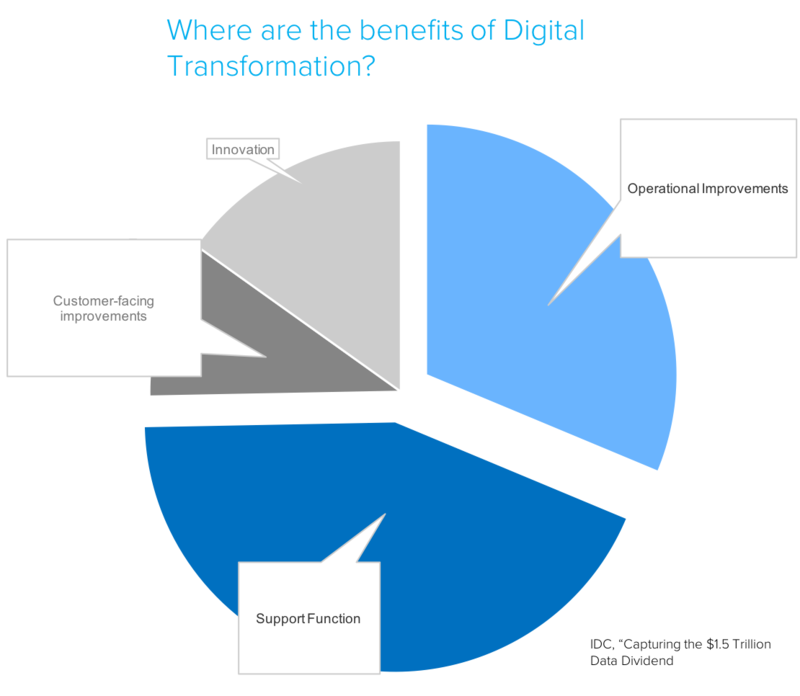 This explains why a 2018 global survey of IT professionals revealed only 8% of enterprises consider themselves truly digitally transformed and 22% are still in the early stages of their ‘digital’ transformation. One of the reasons for this, is that the vast majority of efforts have been focused on the customer journey and not looked at internal processes in the office. The digital customer journey often generates more paper as internal systems are unable to 'talk' to one another and as a result, often documents are printed and then scanned back in to a different system. Research by AIIM illustrates this showing that "On average, 45% of documents that are scanned are 100% ‘born digital’." Digital gaps halt business efficiency and ultimately impact the overall customer experience itself. Analysts IDC agree, stating that the biggest opportunity to realise the benefits of digitisation lies in ‘operational improvements and support functions’. A further challenge in becoming a Digital Organisation is that is it is essential to understand how and why paper is used in the business, and further how to improve the process when making it digital. Let’s remember, simply digitising an inherently bad process may make it slightly quicker, but will not result in the far-reaching benefits that are possible. Moreover, once you have begun your Digital Journey, how do you make the most of the big data? fine-tuned to your processes and make informed, strategic business decisions? Above all else, the question is how do you get started on the path to an intelligent, digital workplace? Xenith have created a path to digital transformation which can be split up into 3 stages : Understand, Execute and Improve, which will set you up to becoming a truly Digital Organisation. Are you ready for paper-to-digital transformation? Review the following statements and see how many you agree with to get an idea of whether you're ready for digital transformation. We’ve realised some benefits from MPS, but we believe we could do much more. Key information moves into, out of and around the organization on paper. People print documents for one-off occasions. People print the same documents over and over again. People spend a lot of their time transferring information to and from paper. We have too much space dedicated to storing paper documents. We’re not sure what archives we hold, or where specific records can be found. We use paper purely because "that’s the way we've always done it." We use paper to support traditional physical processes such as adding wet-ink signatures to documents.